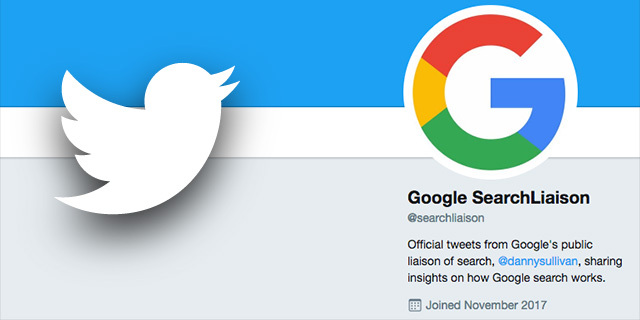 Danny Sullivan, now at Google, is Google's Search Liaison and has created a new Twitter account @searchliaison for official Google communication explaining how Google works. Danny explained that if you dislike his Starwars tweets or personal tweets and just want the Google stuff, go there. It will just be Google facing tweets on the @searchliaison account. I'll retweet here anything I share there. I'll also likely do follow-up replies from this account. Plus, I'll still be sharing some minor things here. But larger issue stuff, @searchliaison will have the updates. I think this makes a lot of sense and glad Danny did that. Of course, I am sure, as he said, he will be sharing stuff about Google on his personal account. The description of the new Google Twitter account reads "Official tweets from Google's public liaison of search, @dannysullivan, sharing insights on how Google search works." Hat tip to Michelle Robbins for covering this first.